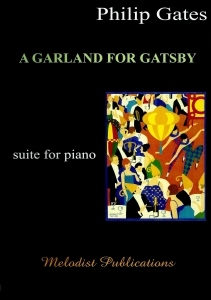 ‘A Garland for Gatsby’ is a piano sequence presenting characters and scenes from F.Scott Fitzgerald's novel ‘The Great Gatsby’. Jazz Age 1920's rhythms contrast with darker music reflecting the tragic narrative. The full Compact Disc recording is available to purchase and the full track listing can be viewed in the Discography. The audio recording took place at Saint John's Church in New Alresford. On 13th December 2008 the composer returned to give the first concert performance of the work in its complete form.